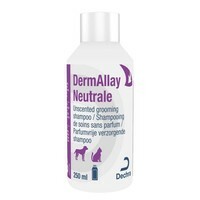 Dermallay Neutrale Grooming Dog Shampoo is a conditioning shampoo designed to keep coats glossy and healthy. Dermallay Neutrale shampoo is pH balanced skin moisturising formula will gently degrease and detangle hair leaving it shiny and silky soft to touch. Dermallay Neutrale shampoo is suitable for regular use to maintain a healthy glossy coat. Wet the coat thoroughly with clean warm water. Apply Neutrale Shampoo to the dog at several points and massage into the coat, making sure that sufficient shampoo is used to raise a lather. Avoid the eyes. Rinse off with clean, warm water and dry thoroughly.